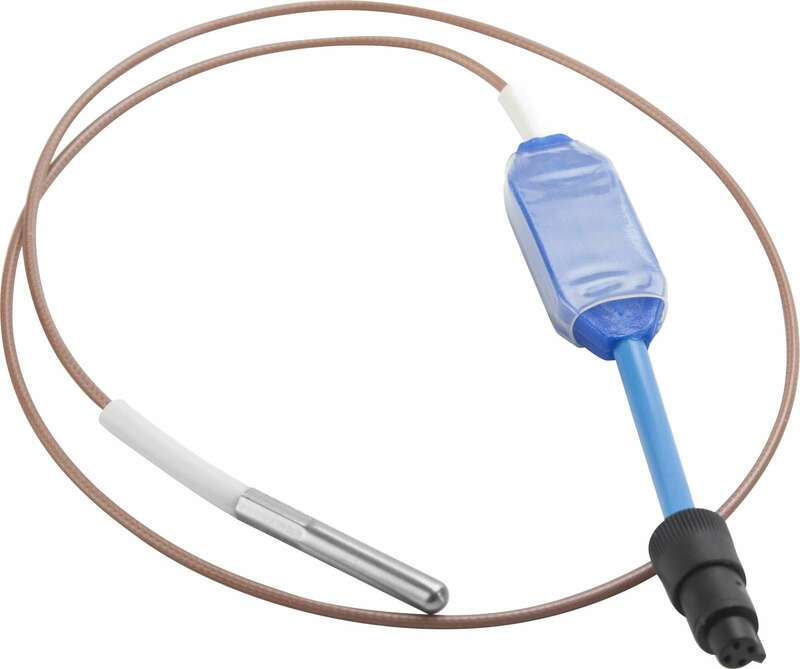 Temperature intelligent sensors up to 200°C, thin cable standard cable length 50 cm, different probes available, cannot be switched; for longer cable length purchase ZED extensions. This sensor is already connected, included in the price, on the ZED IT T200. Intelligent sensors are much more than simple sensors. The idea of an intelligent sensor is based on the fact that its parameters (serial number, type etc.) and the calibration data are stored electronically in a circuit installed on its cable or inside the connector. In this way you can connect to a reading device or directly to your PC, several intelligent sensors of different kind and they will all be recognized for what they are and what they are able to read, along with their calibration data. The sensor sends to the device (PC or data logger) a digital calibrated data. The main feature of the intelligent sensors, used in the Syrinx system and connected to the ZED modules, is the recalibration procedure: easy, quick and not expensive. You won't need to remove the ZEDs from their position. You won't need to send the sensors to Tecnosoft for recalibration and therefore remain without monitoring. Before calibration expires order the recalibration service for intelligent sensors. You will receive new sensors to replace the expiring ones that will be sent back to Tecnosoft later on. All intelligent sensors come with an Accredia (NIST equivalent) traceable calibration certificate included. 4 points within a 120°C span within the range 0 °C ÷ +200 °C. Specify the calibration points before purchase or recalibration.